A new report from Dr Gabriel Scally has found that the policy on open disclosure which he said has been judged to be deeply flawed remains in place in the health system here. The policy came under severe criticism in the Scally Report into the CervicalCheck crisis, published in September 2018. It followed the revelation last May, that CervicalCheck had conducted a 10-year audit of previous smear tests but had not informed the women involved of the results. In that report, Dr Scally described the current policy as deeply contradictory and unsatisfactory, with no compelling requirement on clinicians to disclose failings in the care process. His latest report states: "It is notable that the previous policy, which has been judged to be deeply flawed, remains in place." His comments are contained in his new report to the Minister for Health, on how the Health Service Executive, Department of Health and other agencies have implemented his 50 inquiry recommendations. The report has also been provided to the patient advocacy group, 221+. Dr Scally said he was very encouraged by progress to date on the implementation of the recommendations and how the HSE had committed resources and efforts to these. On the issue of open disclosure, the Scally Investigation report last year recommended that the HSE's open disclosure policy and guidelines be revised as a matter of urgency. He said at the time that the revised policies must reflect the primacy of the right of patients to have full knowledge about their healthcare, as and when the so wish and, in particular, their right to be informed about any failings in that care process. He has scored the implementation of the open disclosure and the HSE recommendations as being 'on track'. A number of measures are due for completion during 2019, including the need for the HSE to revise its open disclosure policy as well as the Department of Health to oversee the introduction of a Patient Safety Bill. Dr Scally said that this should be completed by July. This Bill is due to provide for the option not to disclose an error or mishap to a patient, to be only exercised in a very limited number of well-defined and explicit circumstances. It is also due to provide for a statutory duty of candour, on individual healthcare professionals and on the organisations for which they work. 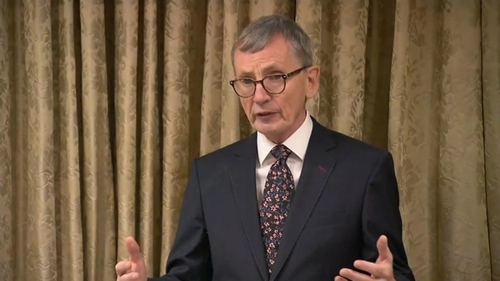 Dr Scally has noted that a number of the recommendations for the Department of Health are subject to the Patient Safety Bill and the Health Service Executive (Governance) Bill passing through the Houses of the Oireachtas. His report has said that a significant number of the Department of Health actions are due for completion in the second quarter of this year "and should be managed closely to ensure that timeframes do not begin to slip". Dr Scally's latest report has found that two actions by the National Cancer Registry of Ireland are behind schedule. One is a redevelopment of procedures for recording cancer data and the second is for external expert and stakeholder perspectives within the governance system. He said that discussions are ongoing between the NCRI and the Department of Health regarding the allocation of staff resources to assist with implementing the recommendations for the cancer registry. Overall the latest report from Dr Scally has concluded that most recommendations are on track, a small number of behind schedule and some are completed. Dr Scally has noted in his latest report that over 70 per cent of the implementation actions fall to the HSE and many are front-loaded. He has expressed concern at the capacity of the HSE to deliver so many actions within a short time period. He said the HSE's implementation plan appears to be 'over-ambitious', with too many activities concentrated within a single time period, that future reviews may find have been subject to delay. He said "it may be prudent for the HSE to review the deadlines and some of these actions prior to the next independent progress review". His next review report is due in May. Meanwhile, Minister for Health Simon Harris has welcomed Dr Scally’s report. Mr Harris said that Dr Scally’s independent view is that the plan is a comprehensive response to the Scoping Inquiry report, backed by the necessary effort and resources to address the issues he identified. Mr Harris said work is well underway in his Department, as well as in the HSE and the National Cancer Registry, to ensure full implementation, so that women can have absolute confidence in the cervical screening service. Mr Harris has said he is confident that the Patient Safety Bill will become law before the end of the year. The HSE has said that a revised policy on open disclosure is expected to be published and communicated to all HSE staff before the end of April and implementation will be followed through the health service from then, to the end of the year. In a statement, it said it had "made significant progress to date implementing recommendations and actions that fall within its remit". It said the majority of the recommendations and actions will be completed by the end of this year. With regards to reviewing the open disclosure policy, the statement added: "This has been progressed and remains on target, as was noted by Dr Scally, and a revised policy was recently approved by the HSE Directorate. "The revised policy was developed following extensive consultation, including input from patients and people directly affected by failures in disclosure during the CervicalCheck audit. "The revised policy is expected to be published and communicated to all HSE staff before the end of April, and implementation of the revised policy will be followed through our health service from then to the end of the year."